What some guys won't say to get attention . . .
Analogizing Rush Limbaugh to a James Bond villain, Chris Matthews today fantasized: "at some point somebody's going to jam a CO2 pellet into his head and he's going to explode like a giant blimp." Hosting MSNBC's 10 AM hour today, Matthews made his remark while chatting with Politico's Jonathan Martin and Anne Kornblut of WaPo. 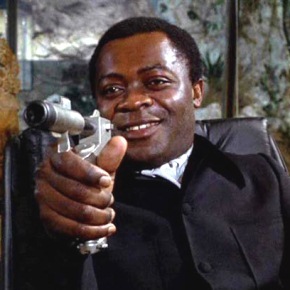 CHRIS MATTHEWS: You guys see Live and Let Die, the great Bond film with Yaphet Kotto as the bad guy, Mr. Big? In the end they jam a big CO2 pellet in his face and he blew up. I have to tell you, Rush Limbaugh is looking more and more like Mr. Big, and at some point somebody's going to jam a CO2 pellet into his head and he's going to explode like a giant blimp. That day may come. Not yet. But we'll be there to watch. I think he's Mr. Big, I think Yaphet Kotto. Are you watching, Rush? That closing "are you watching, Rush?" was the giveaway. Matthews, whose anemic ratings trail even Rachel Maddow's in the MSNBC line-up, is desperately hoping someone—anyone—is watching. And if it takes publicly fantasizing about the violent death of a political opponent, well, all's apparently fair in love and ratings in Matthews' mind. Note: Matthews didn't even get his mean-spirited metaphor right. "Looking more and more like Mr. Big"? Wrong. If anything, the suddenly svelte Limbaugh is looking less and less like him.